Technologies are changing the face of learning, education and society. A surprisingly small number of companies own that world change. So, is the future of learning and education open? Do we foresee a sustainable future learning space available to all? Is learning and education the last digital frontier in a world of disruption and change foreseen by few -- if any? How do we respond, as citizens, learners and custodians of education? How do knowledge institutions collaborate in and with their regions? How do we find meaningful relations with the growing number of great EdTech companies and thinkers? How do we foster entrepreneurship and innovation? The last two decades have changed more in our technological base for learning and education than what happened in the previous two centuries. The book will survive. We will continue to learn, to read and to seek out the insights that only encounters with key ideas can give. But what is a book -- these days? How can we as smarter universities and societies build sustainable learning for coming generations? Perhaps the key entrepreneurial question of our time. Contemporary Communications Technology (CCT) is networked, digital, diverse, multimodal and expanding. Books are everywhere, in all kinds of formats. There are ten videos and a dozen podcasts for every book one might want to apply in a classroom. Students read and study differently. For the most part, their sense of the English language is very good across the world. They travel more than every and they live in different parts of the world virtually – all the time. There is in a sense a new reality in education, stemming fro the fact that the revelatory reading of the book, and its ways and means of ordering a dialogue between the author and the reader, has now changed. And yet, one may argue that learning is still hard work – based on gaining insights from exposure to ideas and facts. On this workshop theme we invite discussions on the fundamentals of learning in an age of media ubiquity. Approaches to learning and adapting to new services, innovations, products and practices is key to development work. We invite discussions on good practices in uses of ICT for learning, critical discussions, comparative studies, and more. In an age of digital and mobile media, it may be that many challenges remain the same while our understanding of them and the role of technology in the equation, is changing. Universities now cooperate in networked modes, bridging North and South. Modernization happens. Dependency is a fact. A key aspect of managing Information and Communication Technology as an aspect of development and learning in that context, is perhaps to also understand ICT from the point of view of medium, mediation, and media? Technology makes sense in context. Context is cultural. To think of design as as “design thinking” requires an understanding that design is more than dressing up the old in new ways, and more than form. Design is process. In fact, human centered design is the process of applying an understanding of how human beings interact, what makes sense and what generates meaning in particular spaces, in uses of artifacts. To bring human centered design into the discussion of media rich learning is an invitation to our anthropological sense of technology´s role in learning and society, if not to say our archeological curiosity with the past – buildings and places in the present . What will the future classroom look like, if we take this approach? Perhaps not filled with gadgets, and neither with rows of chairs and desks? Maybe something entirely different? You figure it out. That is why we are asking. Bordering on all the themes presented before, the question of entrepreneurship invites perspectives, products, processes and projects centering on solutions-oriented change work. While it is true that a few companies own much of the world´s learning technologies, we all recognize that it is more complex than that. There is a wealth of experience, approaches, products and services that belong in this ecology, having carved out their niche. 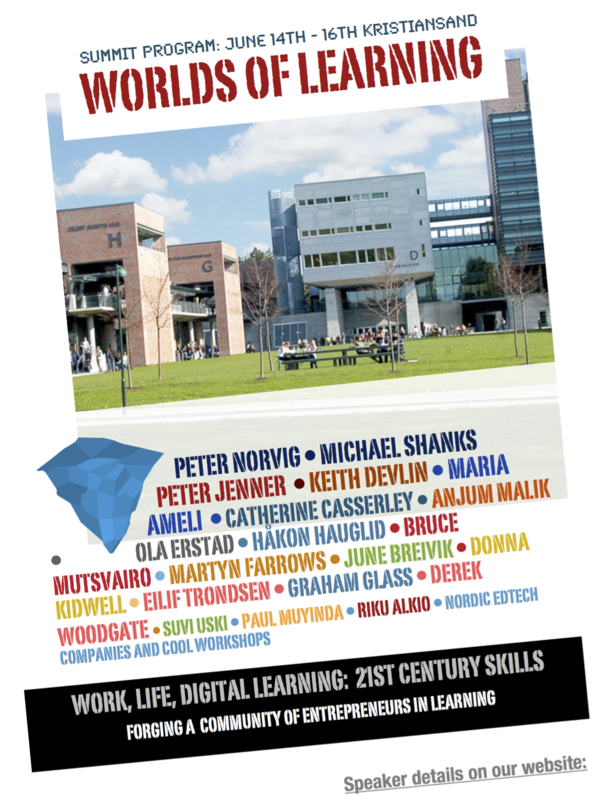 A key element in this year´s summit is an ongoing commitment by the project team to bring to the front of our attention the richness of the Nordic Ed Tech Community. Our Nordic EdTech Network is growing. The future of media rich education may be more dependent on our imagination than our technologies. More often than not, the challenge of ICT in education is approached from the point of view that of ICT and pedagogy. Maybe it´s time to take a different approach? In our insistence on a futures orientation, there is an invitation to employ what C. Wright Mills famously dubbed the “sociological imagination” back in the infant ages of the computer communications industry. His concern was not technology, but “techne” – knowhow, and power. There is a relation there. As the world becomes networked and digitalized, everything moves faster. Everything can in principle be monitored. Everything gets analyzed. Perhaps it is time to confront policy makers with challenge to think through more critically how technologies and the absence of media policy are shaping our learning society? I keep coming back to these conferences. May there be many more. Executive Director, HStar Institute, Stanford University.